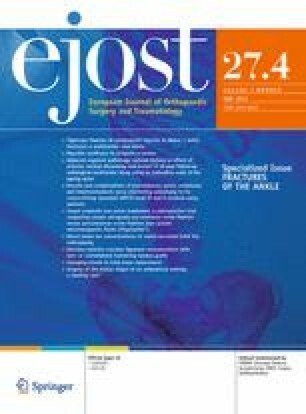 The goal of this study was to describe an internal fixation technique for periprosthetic humeral fractures using a cortical onlay strut allograft stabilized with cerclage wires and to evaluate the preliminary results of this approach. An anterolateral approach was used to direct access the fracture and to protect the radial nerve. The fracture was reduced with two forceps, under visual control. The fracture was surrounded by two hemicylinder tibial allografts, placed around the humerus with no prior reaming to create a “sarcophagus” system. The allograft was as long as possible for optimal mechanical stability, without creating impingement with the glenoid and the elbow. Final fixation of the allograft was obtained with two cerclage wires. The arm was immobilized in a simple sling. Passive then active rehabilitation was begun after 1 month. Six women, mean age 74.3 ± 10.9 years old, were included in the study between 2013 and 2015 with a mean follow-up of 10 ± 2 months. Bone union was obtained in all patients after 6 months of follow-up with no recurrent fractures. T. Bauer is consultant for Arthrex. P. Hardy is consultant for Arthrex and Zimmer. The other authors (A. Thès, S. Klouche, M. de Tienda) declare that they have no conflicts of interest concerning this article. According to the past Huriet law on biomedical research and to the current regulation that went into effect in August 2006 (law n°2004-806), such studies do not require prior submission or approval to/from an IRB, and they do not require written consent. The database was declared at the National Commission for Data Protection (Commission Nationale de l’Informatique et des Libertés, CNIL, No. 470235).